Although glycosyl inositol phosphoryl ceramides (GIPCs) represent the most abundant class of sphingolipids in plants, they still remain poorly characterized in terms of structure and biodiversity. More than 50 years after their discovery, little is known about their subcellular distribution and their exact roles in membrane structure and biological functions. This review is focused on extraction and characterization methods of GIPCs occurring in plants and fungi. Global methods for characterizing ceramide moieties of GIPCs revealed the structures of long-chain bases (LCBs) and fatty acids (FAs): LCBs are dominated by tri-hydroxylated molecules such as monounsaturated and saturated phytosphingosine (t18:1 and t18:0, respectively) in plants and mainly phytosphingosine (t18:0 and t20:0) in fungi; FA are generally 14–26 carbon atoms long in plants and 16–26 carbon atoms long in fungi, these chains being often hydroxylated in position 2. Mass spectrometry plays a pivotal role in the assessment of GIPC diversity and the characterization of their structures. Indeed, it allowed to determine that the core structure of GIPC polar heads in plants is Hex(R1)-HexA-IPC, with R1 being a hydroxyl, an amine, or a N-acetylamine group, whereas the core structure in fungi is Man-IPC. Notably, information gained from tandem mass spectrometry spectra was most useful to describe the huge variety of structures encountered in plants and fungi and reveal GIPCs with yet uncharacterized polar head structures, such as hexose–inositol phosphoceramide in Chondracanthus acicularis and (hexuronic acid)4–inositol phosphoceramide and hexose–(hexuronic acid)3–inositol phosphoceramide in Ulva lactuca. 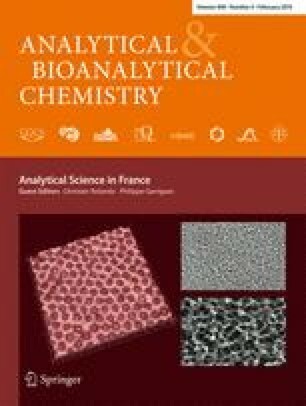 Published in the special issue Analytical Science in France with guest editors Christian Rolando and Philippe Garrigues. The work was supported by the French Agence Nationale pour la Recherche (contract no. NT09_517917 PANACEA).